In a near-empty chamber, Warren rose in the evening in opposition to Sessions, the Republican senator from Alabama. She cited some of the issues — including accusations that he targeted black voters in an investigation — that stifled his nomination for a federal judgeship in the 1980s. Elizabeth Warren, after quoting from a decades-old letter written by Martin Luther King Jr.’s widow, was ruled in violation of Senate rules. “Mr. Sessions has used the awesome power of his office to chill the free exercise of the vote by black citizens in the district he now seeks to serve as a federal judge,” King wrote to the Senate Judiciary Committee, then chaired by Strom Thurmond of South Carolina. Earlier during her speech, Warren also quoted from Senator Edward M. Kennedy — who had called Sessions a “disgrace to the Justice Department.” She was issued a warning. The quotes from King prompted Senate majority leader Mitch McConnell to come to the Senate floor and call for a vote that Warren was violating Senate rules. “I am surprised that the words of Coretta Scott King are not suitable for debate in the United States Senate,” Warren responded. She asked for permission to continue, but McConnell objected. “I’ve been red-carded; I’ve been thrown out of the game,” Warren said in a phone interview with the Globe, stepping off briefly from the Senate floor where she continued to sit although she was no longer allowed to speak. She said she had not expected to get rebuked for her speech. “I thought what Senator Kennedy said back then would be fair game,” she said of her reading of Kennedy’s 1986 statement. “At that time it got both Republican and Democratic votes against Jeff Sessions. Warren said she hopes that everyone will read the letter she was cut off from reading. “It’s a powerful letter and it describes a moment in our history that is important to every one of us today,” she said. Around 11 p.m., Warren continued her protest by reading the King letter just outside the Senate chamber, which she streamed live on Facebook. The debate in the Senate was yet another sign of how toxic the political atmosphere has become, particularly in confirming President Trump’s Cabinet members. Democrats don’t have enough supporters in the Senate to stifle the confirmations, but they have attempted instead to delay votes. After the vote upholding the finding that she had violated Senate rules, McConnell said that Warren ignored all the warnings to stop attacking Sessions. Senator Kamala Harris, a newly elected California Democrat, called the vote to hold Warren in violation of the rule outrageous and asked the Senate to allow her to speak during debate. Democrats also seized on the episode on social media. Senate Democrats pointed to recent instances — including when Senator Ted Cruz last year accused McConnell of “a simple lie,” or when Senator David Perdue last week accused minority leader Charles Schumer of “a tear-jerking performance over the past weekend belongs at the Screen Actors Guild awards” — that did not trigger a similar rebuke. 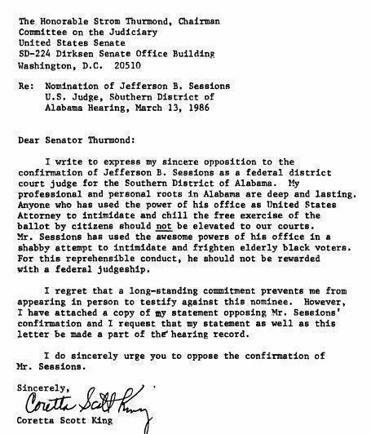 “I never ever saw a time when a member of the Senate asked to put into the record a letter — especially by a civil rights icon — and somebody objected,” said Senator Patrick Leahy, the Vermont Democrat and the longest-serving member of the Senate. Republicans countered that Warren broke a rule, and should be punished. It also triggered a series of speeches about how far the dialogue in the Senate had fallen. Jon Keller: Why all the Warren-bashing? Victoria McGrane can be reached at victoria.mcgrane@globe.com. Follow her on Twitter@vgmac. Matt Viser can be reached atmatt.viser@globe.com. Follow him on Twitter @mviser.